Chef Irie jubilantly emceed the cooking demonstrations. Chef Samantha, a Southern native, said, “Aside from loving to eat I was always interested in the process. My mom is a terrible cook, I have an early memory of her giving me food poisoning. To this day I can't eat linguine with white sauce." Throughout the demonstrations, Chef Irie wove through the audience to chat with members about their backgrounds with food. Chef Samantha created a Jamaican twist on Shrimp and Grits for her demonstration. Chef Max Hardy, founder of the One Chef Can 86 Hunger Foundation, spoke of how his work as a chef connects to food activism. Chef Max made a curried salmon with avocado salsa. Chef Andre Fowles, a winning contestant on the Food Network's Chopped series, talked about his desires to "elevate Caribbean food to heights unknown." Patrons of the festival brought camping chairs and umbrellas, giving the event a communal feel. Across the park, food vendors set up shop to deliver festival goers with a huge variety of jerk themed Caribbean food. Cooks lobbed mounds of chicken breasts onto the grill for the thousands of festival goers. The jumbo shrimp on the grill proved that dishes other than jerk chicken were in high demand. These vendors spent the day frying fresh dough for fry bakes. At the Caribbean Corn stand, you could get this summer staple with the jerk twist of thyme, coconut flakes, lime and paprika. It was easy to get glimpses of fresh jerk meat being carved at many of the vendors. The vendors at this booth hacked away at coconuts to provide a thirst quencher after the spicy jerk food, fresh coconut water. All of the booths were from the greater New York City area, and the festival made it easy to discover new restaurants for when you get the craving for jerk spices. After chicken, jerk fish seemed to be the most popular item at the stands. I smothered my chicken in different sauces from the vendor, and the array of flavors was totally worth the burning sensation in my mouth. 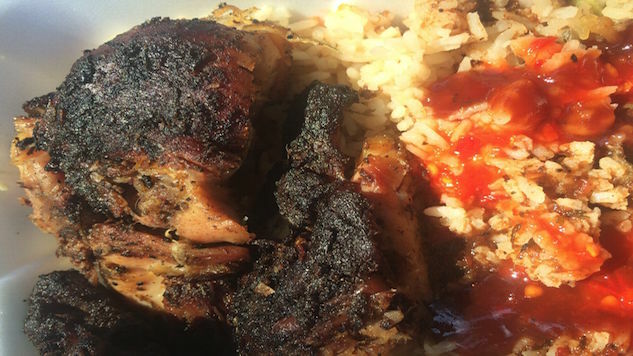 On July 17 the Grace Jamaican Jerk Festival returned to Queens for its sixth year. The festival celebrated music, culture, community and of course Jamaica’s famed jerk dishes. The event brought together local Caribbean communities and put a strong emphasis on food as a means of social gathering. From the cooking demonstrations to the wide array of vendors, the Grace Jamaican Jerk Festival proved that contemporary Caribbean food is about much more than Jamaica’s signature dish.